Bent grass is a low-growing grass that spreads by means of above-ground stolons. You will primarily see bent grass used on putting greens due to its low growing, carpet-like turf. Bent grass is a high maintenance grass that requires frequent mowing, high amounts of fertilizer and a lot of water. Bent grass is best mowed using a reel mower due to its low mowing height requirements. Bent grass can be challenging to care for and requires a little skill and patience. Mow the bent grass every other day at a height of 1/10 inch to 1/7 inch high. Use a reel mower designed for putting greens to mow the bent grass. Fertilize with a high quality lawn fertilizer and provide 1/10 lb. of nitrogen per 1,000 square feet every 14 days during the growing season. This will equate to 2 to 4 lbs. of nitrogen per 1,000 square feet over the course of the year. Set up lawn sprinklers around your bent grass green. Set up enough sprinklers so that your entire green has equal coverage. Run the sprinklers every 4 to 10 days for 30 to 40 minutes. Clay soils retain moisture easier so most likely will be irrigated around every 10 days while sandy soils don't retain moisture as easily so will most likely need to be irrigated every 4 days. Rent a core aerator from your local home improvement store. Read the operation manual thoroughly to become comfortable with that particular make and model. Start the aerator up and drive it over the bent grass green in parallel paths until the entire green is aerated. Run the aerator over the green again perpendicular to the first set of passes. You should now have a bunch of plugs laying on top of the green. Let these dissolve back into the ground naturally. 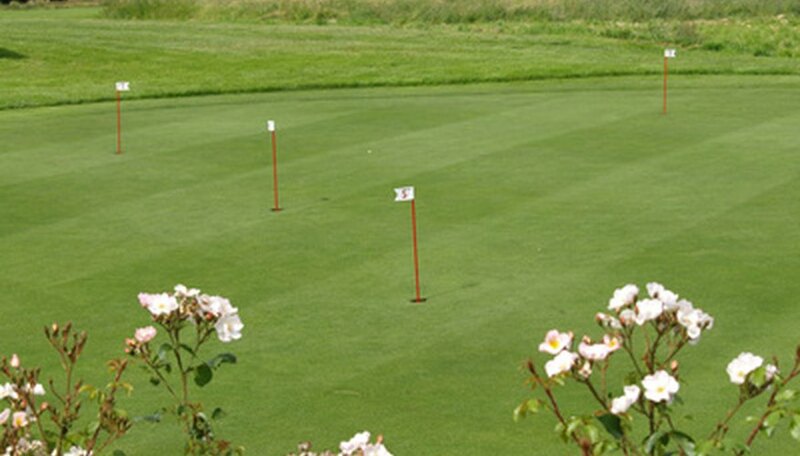 Aerate the green two to three times per year, with spring and fall being the ideal times. An early summer aeration is a good choice for greens with high traffic. When aerating greens, make sure you use a core-type aerator that removes the plugs from the ground. Spike-type aerators simply compact the soil more and provide no benefit to the green. A great way to test for soil moisture is to push a screwdriver into the ground. If it pushes in easily, the soil is sufficiently moist. If you meet significant resistance, you will need to irrigate more frequently. Each area's soil and climate is slightly different so you may need to do a little trial and error until you find an irrigation schedule that works for you. All About Lawns: How Do I Aerate?